The Indian Startup Story does seem to have a very bright future thanks to the massive fundings, consolidation activities, evolving technology and an burgeoning domestic market, and not to forget the initiative taken by the government in recent days to boost the innovation. The GOI initiatives like “Make in India”, “Design in India” and “Digital India” are a testimony for the same. By the end of 2014 we already had the number of startups at 3100. If we go at this pace we can have an estimated number of startups at 11500 by 2020. The Startup culture can certainly grip the country like a revolution. This in turn is expected to boost the economy in a huge way. In order to make this revolution a success we would be required to understand the indigenous startup ecosystem and the measures for preparing a conducive environment for the same. The face of public transport in India has changed over the last decade thanks to the growing players in this segment. One of the successful ventures that the country can boast about is the Ola (formerly known as Olacabs). 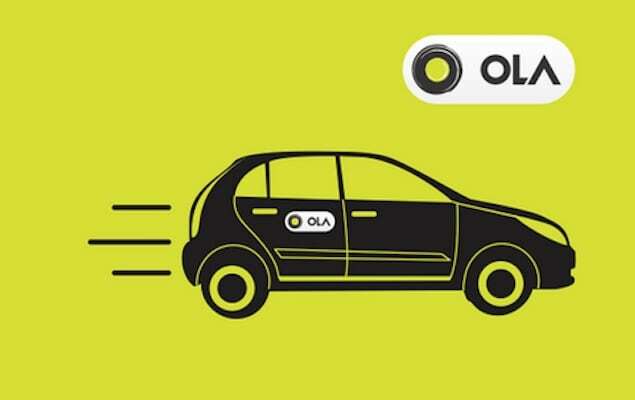 Ola , in April 2015, announced raising $400 million in its series E round of funding led by DST Global with participation from GIC, Falcon Edge Capital, and existing investors SoftBank Group, Tiger Global, Steadview Capital and Accel Partners US. From this amount, Ola has earmarked $100 million towards fuelling expansion and growth of the acquired TaxiForSure. Ola plans to be in 200 cities by the end of this year. Lingerie was an untapped market and Zivame truly used this fact in their stride. Richa Kar, CEO of Zivame.com says “I realized that lingerie as a category in India is under-served. There is unavailability of sizes, social discomfort and very poor market penetration”.The freedom of choice and the sense of liberation that it has provided to its consumers is unparalleled by traditional lingerie stores. The Real Estate business has grown manifolds and the major player in this segment is Housing.com. They’re growing intelligently and rapidly and surpassed all competition within two years of launch. They acquired Delhi-based Realty Business Intelligence for an estimated USD 2-4 million. Realty BI tracks real estate trends and creates collateral risk management tools through the use of technology. By optimizing the ad layout, AdPushup fights banner blindness, increasing the website’s ad revenue from existing ad networks. A transparent organization, they have blogged about how they raised their first round of funding, built their office and how they did their marketing. With a whooping 80 million mobile wallets and more than 15 million orders per month, Paytm has revolutionized mobile commerce in India. It’s a leading payment solutions provider to e-commerce merchants using its RBI approved semi-closed wallet, also its USP. InMobi is a performance based mobile ad network backed by Soft Bank and Kleiner Perkins Caufield & Byers. The company was founded in 2007 in India with offices in several countries.InMobi aims at redefining mobile first customer-engagement platform through its suite of products ranging from app distribution & monetization to brand advertisements. With close to 759 million users across 160+ countries, InMobi serves billions of ads daily. With 350+ data scientists, engineers and analysts spread across the globe, InMobi continues to lead the industry in building architecturally superior mobile-first platforms. Between 2010 and 2014, the infusion of Venture Capital increased manifolds. Angel investment too has multiplied almost 8 times from $4.2 million to $32.2 million. Below are a few examples of how the budding startups have tried raising funds. The first round of institutional funding for Gurgaon-based Chaayos came as a non-tech investment. This year, Tiger Global led a $5 million financing round in this tea chain, with participation from Ola founders Bhavish Aggarwal and Ankit Bhati. Chaayos retails tea leaves, which it sources from tea estates to create its own blends and has designed innovative kettles that can deliver a liter of chai, keeping it hot for an hour and a half. Using this investment, the tea chain is planning to expand its services to Mumbai, Bangalore and Delhi NCR by opening more than 50 new outlets. The plan for Chaayos is to setup 60 more outlets in 2015 and scale up rapidly. Apart from outlets, they already have tie-ups with corporates for delivery. House hunting portal Housing.com raised a sum of $90 Million from SoftBank, the Japanese telecom and internet giant. Their products like Slice View and Price Heat Maps emphasize their strong focus on Data & Analytics and will require a major share of the received funding. Over the last decade the Foreign investor interest in India has increased at a huge pace, this can be attributed to various factors but the biggest one is the consumer growth, relaxation in government norms, backed by the mobile revolution. TGM is currently the top investor in startups in India during the first four months of 2015. Indian startups have featured in 18 of its 26 funding rounds globally in 2015 so far. It has started to make early-stage investments in India now. Tiger was among the top investors in India at $422 million in 2014, despite a lean start. 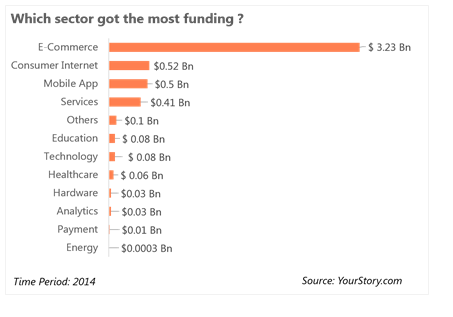 After April, with massive fund infusion into Flipkart, which raised a total of almost $2 billion in 2014. It was followed by Russian investor Yuri Milner-led DST Global, which invested $352 million. Japanese telecom giant Softbank invested $282 million in Indian startups in 2014. During the same period last year, VC firm Nexus Venture Partners was the largest VC player in the country with $73 million in funding, followed by Kalaari Capital with $45 million in six deals. VC firm Sequoia Capital has made investment worth $208 million in the first four months of 2015 across 14 deals. Accel Partners, one of the early investors in the scene have made multi-stage investments in internet technology companies between $0.5-50 million in its portfolio of companies which include BabyOye, BookMyShow, Myntra, CommonFloor, Zansaar, Probe, and Flipkart. Other foreign investors that have shaped the Indian funding landscape since 2009 are 500 Startups (by Dave Mclure and Pankaj Jain), and Inventus Capital Partners among many others. Helion Venture Partners was top of the investors list for the year 2014, going by the total number of deals made, followed by Sequoia Capital, Blume Ventures, Kalaari Capital, and Accel Partners. However with the onset of the year 2015 Tiger Global has emerged at the top spot with cumulative investments of $269 million (Ventura Intelligence) in 11 deals, followed by Sequoia Capital with $208 million invested in 14 deals, and Steadview Capital with $107 million with two deals. When it comes to the cities where the startups that got funded were based, Bangalore led the charts with $2.43 billion, followed by New Delhi at $1.43 billion, and Mumbai stood in the third position with $610 million. And if we break it down by sectors, e-commerce unsurprisingly took the biggest piece of the pie with $3.23 billion, followed by the closely related sectors of consumer Internet and mobile apps. With the process of investment and exit becoming smoother due to a combination of factors, the scenario looks promising. In 2014, 43 startups were acquired; so far this year the number has been 41, with startups themselves being the most acquisitive of the lot. Of the 41, merely two deals were struck by large corporates, with Godrej and Mahindra & Mahindra as the buyers. With Housing.com being recently in the news for acquiring Realty BI, let’s look at some other M&A deals of this year till now. MakeMyTrip Limited announced the acquisition of the intuitive travel planner Mygola. Enablers like NASSCOM and iSpirt bring together key stakeholders of the ecosystem including startup incubators, accelerators, angel investors, venture capitalists, support groups, mentors, and technology corporations. NASSCOM has come up with an ambitious initiative called “10,000 Startups”, aiming to scale up the startup ecosystem in India by 10x. The program is supported by Microsoft, Google, Intel, Verisign, and Kotak. This will help to enable incubation, funding and support for 10,000 startups in India over the next ten years. iSpirt is a think tank dedicated to promote existing Indian software product companies. It is different from NASSCOM, which is a trade body and an industry association. Investors in India as well as abroad are becoming experimental, yet extremely well-informed decision makers. The average valuation of an Indian startup is $2.3 million as compared to $4.2 million of an American one. 43 percent of product/digital organizations are focusing on the global market and 28 percent continue to be technology hotspots. With a 59 percent of B2C, 37 percent of B2B, and 4 percent of B2C/ B2B startups, this ecosystem has a lot of ground to cover in terms of securing funding. Acqui-Hiring, technology acquisition, market consolidation, and customer acquisition are the main drivers for increase in M&A of Indian startups. Enhancement in the amount of M&A in India, investors are getting more exit opportunities. Startups are adopting innovative approaches to attract and retain top talent. There is a need for directional efforts to help increase supportive government policies (ease of doing business, tax incentives, participation in Government contracts, availability of risk capital, etc.). 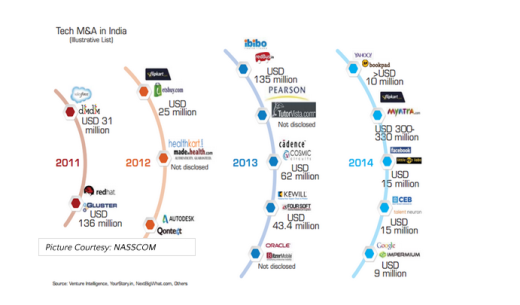 To conclude the Indian Startup Story looks like a promising one. One can only hope that this has a long way to go.